That’s when the highly significant little phrase comes out. She says, “Yes, and it’s important for me to remember that He will forgive me each time I come to Him to repent and really try harder.” From my perspective, her “yes, and” changed a statement of Gospel into one of Law. It goes the other way, too. My friend might say, “I heard such a powerful sermon today. The words really filled me with longing to serve God instead of getting caught up in the values of this world.” That’s when I can’t help interjecting, “Yes, and isn’t it so freeing and inspiring to know that we are children of God even when we fail and do get caught up in the values of the world? That ultimately it doesn’t matter how perfect we are?” From her perspective, I just punctured the balloon of hope (hope that she would “do well” at being spiritual that week) with a fatalistic and discouraging sentence. It’s as if a child said, “I’m going to win this competition!” and I had replied, “Well, I’ll bring a box of tissues so that you can wipe up the tears of disappointment afterwards.” We Lutherans often have a reputation for being joyless pessimists. When I think about these conversations, I can’t help but notice how intensely my friend and I feel the need to add our qualifications. The truth is that our comments don’t just highlight different emphases. They reveal the contrasting concerns behind our emphases: the different, deepest fears of Evangelicals and Lutherans. My Evangelical friend fears that apathy will steal faith. To tell people that they need not strive to serve God, and that they will fail when they do strive, is to her the words of the devil. Such words might result in a Christian who doesn’t care. A Christian who doesn’t try. A Christian who stops going to church, stops praying, stops believing. In contrast, we Lutherans fear that works-righteousness or despair will prevent faith. To us, the “fitness-coach” approach to faith (in which a pastor is urging his parishioners to keep running up the hill) is likely to lead to a Christian who either deludes herself into believing that she is righteous and worthy before God, or a Christian who abandons hope and gives up trying to achieve the impossible because her sinful nature will never ascend to the perfection that God’s law demands. We remember the story of the pre-Reformation Martin Luther who confessed to actually hating God, because he saw God as only a harsh judge who demanded the impossible. This is why our conversations can be so frustrating and filled with the feeling of speaking past each other. Yet neither apathy nor living under the Law is good. Both I and my friend are striving to achieve good things. In addition, both of us are reacting to a realistic knowledge that humans are sinful beings who do a poor job at being Christians. Perfect Christians wouldn’t need to be reminded that they cannot save themselves by works. Perfect Christians wouldn’t need to be reminded that they ought to try to do good works. We both know that Christians are in danger of falling into a corrupt understanding of God and grace, and we differ as to which danger is the most menacing and prevalent. While feeling frustrated about my friend’s theological problems, it occurred to me that I need to remember the danger of fear-based overemphasis. I, too, can go too far because I am reacting against Evangelicals like her. I can fail to use the law as a holy guide to living out my vocations. Suppose that, through laziness, I fail to provide meals to a family with a new baby; to give money to the church; to chat politely with the awkwardly weird guy; to forgive the woman who sneered at me; to let my husband play a video game instead of change a diaper; or turn off the T.V. when the show turns sleazy; or to maintain a selfless attitude. Suppose, above all, I don’t really care about my failures because I figure that God will forgive me anyway. Does that make me a better Lutheran? If I am so quick to proclaim grace to myself that I do not hear the words of the Law as they point to my individual and particular sins, then I… well, I need more Law, I guess, to bring me to repentance. I am not advocating that we abandon true theology or try to become Evangelicals. However, sometimes we need to ignore the Evangelicals long enough to put our Lutheran "yes and's" on pause and examine our own lives and consciences. Doing this is helpful for two reasons. One: it reminds me of what my life should be like (and yes, what I should be striving toward) while simultaneously sending me to the foot of the cross for daily repentance. 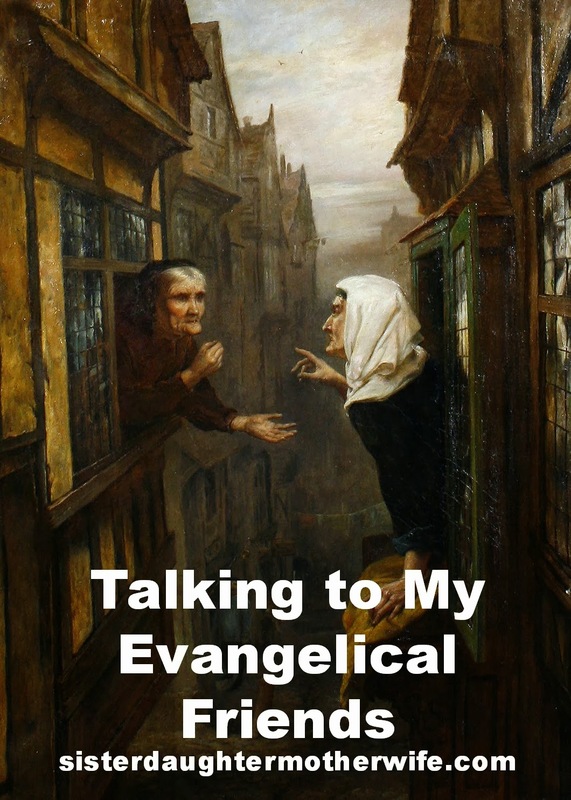 Two: it helps me to understand and dialogue with my Evangelical friend. If I acknowledge her fear of apathy and the truth behind this fear, it may help her truly listen when I share my Lutheranism as well. I can point out that that while zeal for good works is a blessed thing, it is actually counter-productive to focus too much on it, because doing so muddles cause and effect (as did that state governor who noticed that children raised by families who own books get better grades, and thought that he could solve his state's education problems by using state funds to mail free books to every child). I rejoice that we Lutherans acknowledge our own weakness freely, because it is incredibly freeing. A right understanding of Law and Gospel liberates us from focusing on ourselves and our aspirations for goodness and instead lets us focus on God. His goodness and mercy is what inspires us with a desire to serve Him and to live righteous lives. Good works flow from our focus on the cross, not our focus on ourselves and our to-do list-- and these good works are done in gratitude and delight, not a sense of desperate obligation. Lutheranism is joyous. That is what our Evangelical friends have trouble seeing. That is what we can share with them. Image: An Argument from Opposite Premises by Ralph Hedley. Note the awesomeness of a painting title that is also a pun. My husband and I were laughing so heartily over this one that our four-month old looked up and started laughing hysterically, too. Great article... as an Evangelical I am blessed and learned a lot I didn't know. Going to have to read it again a few times!